Sometimes I’m amazed what some scraps of material and a little time on the sewing machine can produce. Clint and I had had a discussion one night about little boys and while we have tried hard to avoid and keep out most of the violent toys and such from our house, we decided that our boys, especially Leighton, needed a chance and opportunity to feel strong and boyish. 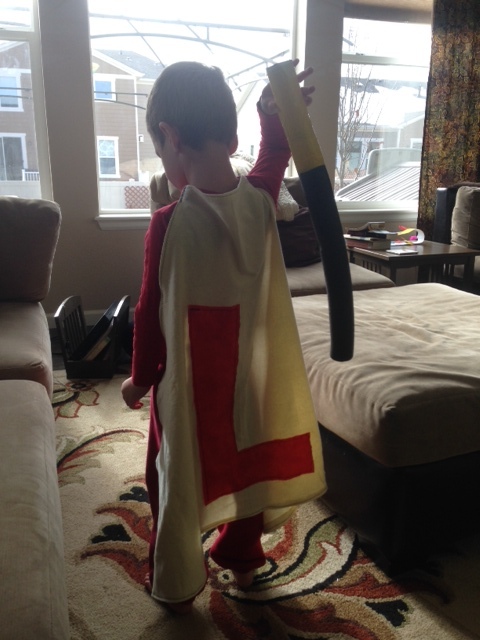 And that having swords wasn’t going to make them grow up to be mass murderers or something. And so the next morning without telling the boys what I was making I sat down and started to work at the sewing machine. About every 30 seconds Leighton asked me what I was making. 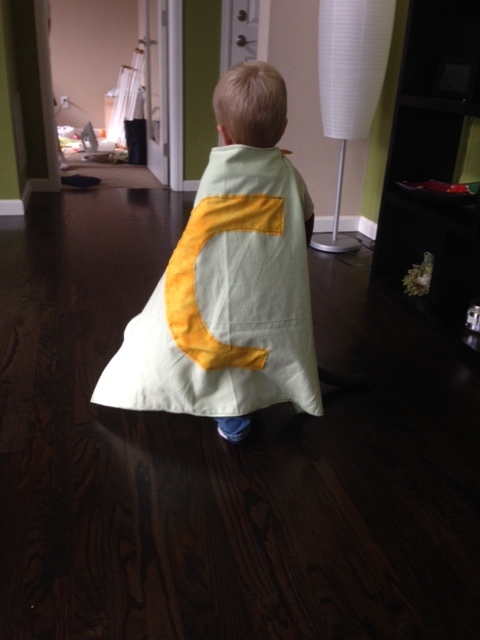 The time flew by and before long I had produced two super hero capes. Leighton’s eyes lit up and he quickly took the sword that Clint had made out of pipe insulating foam and took off running through the house. Caedmon wasn’t exactly sure what was going on but taking Leighton’s lead he took off with his little sword through the house as well. Leighton later informed us that his super her power was making noise. Just what we need. 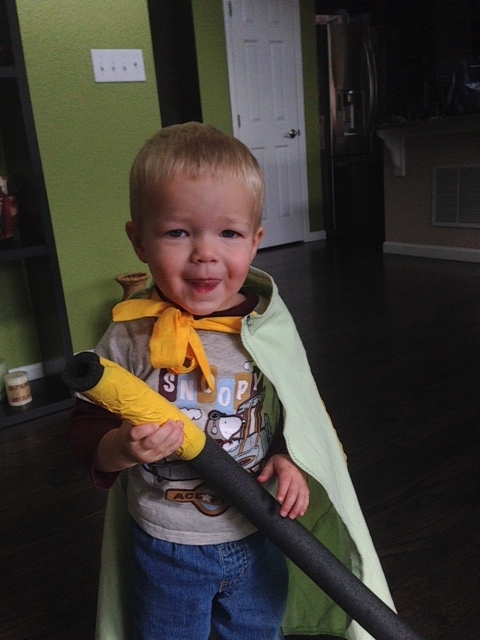 A few days later Leighton was playing with his friend Logan who happened to have a super hero cape as well (much better made then Leighton’s but he didn’t seem to notice) but he also had a matching super hero mask. 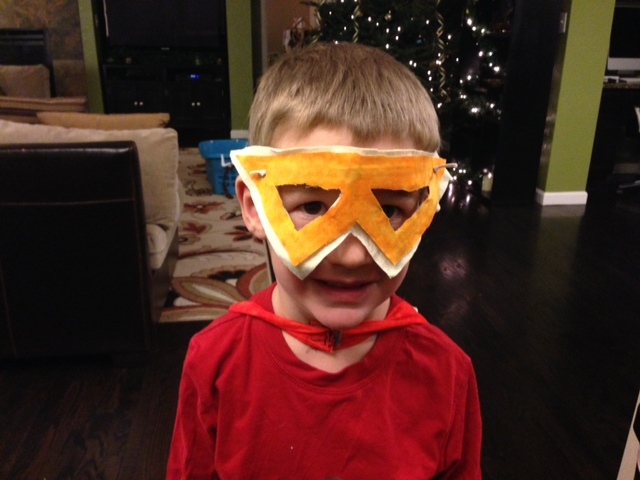 I had worked a night shift and so Leighton came tearing into my room to wake me up and immediately started telling me that I needed to make him a super hero mask. It took a few minutes for my mind to comprehend what he was even talking about, but we set to work and made one that he has been very pleased with and wears everywhere. The world is definitely safer now. There are two new super heroes to protect it. Not exactly sure what they are protecting us from or what they can defend us from with their foam swords, but they are ready to defend us in their matching super hero capes.